One member of President Trump’s cabinet will have a new job come 2019, while another will leave government entirely. Trump on Friday named Office of Management and Budget Director Mick Mulvaney as the acting White House chief of staff. The former congressman will retain his title as head of OMB, the White House said, but will be committed full time to his new role. Mulvaney only recently returned to OMB full time, after spending a year serving simultaneously as acting director of the Consumer Financial Protection Bureau. Current Chief of Staff John Kelly, the second person to hold the title under Trump, is set to leave the White House at the end of the year after a tumultuous 16 months in the position. OMB Deputy Director Russ Vought will “handle day-to-day operations” at OMB, White House Press Secretary Sarah Sanders said. Leadership at the agency is already stretched thin, with Deputy Director for Management Margaret Weichert also serving as acting director at the Office of Personnel Management. On Saturday, Interior Department Secretary Ryan Zinke announced he would resign at the end of the year. 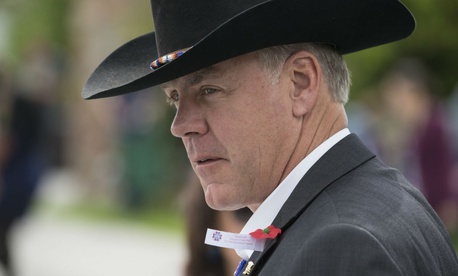 Zinke is facing a slew of investigations into his behavior at the department, including alleged ethical violations and wasteful spending of taxpayer dollars. The Interior inspector general has announced several ongoing probes into allegations against Zinke, and has already cleared him in some and implicated him in others. While maintaining his innocence, the secretary suggested the investigations caused him to leave government. Zinke’s legacy will be largely defined by his opening up of federal lands to the private sector for drilling and other energy production. He clashed with the civil service shortly after taking office, sparking confusion and accusations of politicization after he reassigned dozens of the department’s senior executives. Trump on Saturday praised Zinke for his accomplishments and said he would announce a new secretary next week. Vought, now de facto OMB director, has focused on the budget side of the White House agency. He previously served for seven years at Heritage Action, the policy advocacy arm of the conservative think tank Heritage Foundation. He and Mulvaney have overseen two consecutive budgets that proposed slashing agency funding dramatically, though Congress has declined to go along with those cuts. OMB is currently finalizing Trump’s third budget proposal, which is set to be released in February. A senior administration official told reporters that Trump selected Mulvaney because “the president liked him” and “they get along.” Asked why Mulvaney was only named acting chief of staff, the official said, "Because that’s what the president wants."